Model warship combat is a rapidly growing hobby for adults and mature teenagers that involves the construction and operation of scale models of early 20th Century warships which are capable of battling and sinking each other! The model ships are built to 1:144 scale, which means that each inch on the model equals 12 feet on the actual ship. A model of an Iowa-class battleship from World War 2 is therefore almost 6 feet 2 inches in length! Powered by battery-operated DC motors, and guided by the same type of radio units used to control model airplanes, the ships move at speeds of from 3 ½ to 4 feet per second. The “firepower” in these models is provided by an inexpensive compressed gas, common “CO2” such as that used in soft drink dispensers and in paintball guns. “Cannons” for the models are constructed of short lengths of copper or brass tubing normally found in most hardware stores. The projectiles are inexpensive .177” diameter BB’s typically used in air rifles. The Club’s safety rules require the use of protective eye gear whenever these BB cannons are being used or prepared for use. The Club’s rules of construction require that each model ship have soft penetrable sides made of thin balsa wood, which extend at least 85% of the ship’s length. If the model is struck by a BB at or below the waterline by a nearby model, the wooden skin will be punctured allowing water to seep in. Each model is permitted to have a small pump capable of expelling some of the water that enters, but multiple hits will eventually send the unlucky ship to the bottom. The object of the game is to maneuver your ship skillfully enough so that you can put enough holes in your opponent’s hull to cause it to founder while avoiding the same fate yourself! There are other similar clubs which build and battle model ships of different scales or ships that discharge different sizes of projectiles. Some of these are referred to as “big gun” clubs. 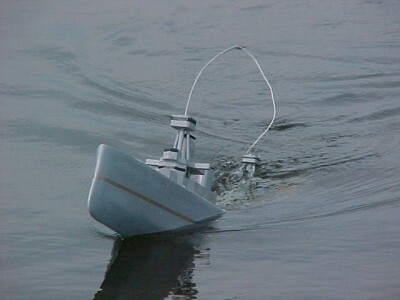 The models built by members of the International R/C Warship Combat Club, Inc. are designed to rapidly discharge their BB’s as the ships maneuver close to each other in battles. 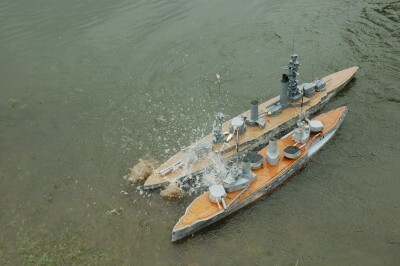 For that reason the IRCWCC version of the hobby is often referred to as “fast gun” model warship combat. In the 1970’s a small group of hobbyists who were familiar with constructing and operating radio controlled model boats and airplanes began experimenting with the concept of building model warships which could actually engage each other in combat. The challenge was to build reusable models with systems capable of inflicting controlled amounts of hull damage on an opponent’s ship, and eventually sinking the model. yes” These individuals, now known as the “founders” of the hobby of model warship combat, were the first to place small gas operated BB-firing cannons on semi-scale model R/C warships. Spread over five states and working over the telephone and through the mail, this group shared their experiences and refined the first cannons, gas systems and pumps that were needed to make functional warship models a reality Perhaps more significantly, however, these individuals began creating and refining the rules that were needed to provide uniformity in both the construction and the battling of these new models so that the hobby could be enjoyed by others safely and expand. Since those early years a continual process of incremental development has resulted in the reliable, cost effective and safe BB cannons and gas and radio systems which are used today throughout the hobby. Remarkably, the current Rules of the IRCWCC follow very closely the originals in intent, and of the changes that have been made, most have been introduced to account for newly developed technologies. Along the way, eco-friendly compressed CO2 was mandated to replace Freon as the gas propellant. Starting in 1991 all newly constructed models had to be built to 1/144 scale. Single-shot cannons were developed, and then mandated, to fire one BB at a time from a magazine of 50 or 75. The offensive and defensive power of each ship’s guns and pumps was allocated based on an analysis of the historic combat power of the prototypes. To help eliminate disputes over historic ship dimensions and speeds, a comprehensive `ship list’ fixing the scale speed and size for models was established. Throughout the 1980’s and ‘90’s, membership in the IRCWCC increased up and down the east coast, in the mid-west, on the west coast and in Canada. In 2004 the IRCWCC was incorporated as a non-stock membership corporation. Along the way, the IRCWCC has given birth to other semi-scale model warship combat clubs. There are now similar clubs that utilize gas-propelled 1/4 inch ball bearings as projectiles; clubs that build ships in the larger 1/96 and 1/72 scales to facilitate the modeling of smaller vessels such as destroyers and PT boats; and other variants. But for us, the original is still the best: the IRCWCC! Make information available to members and others concerning the history of early 20th Century warships, and the construction and operation of semi-scale models of those ships in simulated combat activities. Offers membership to any interested person who is willing to abide by the Bylaws and Rules of the Club. Maintains a web site which provides access to information on the construction and operation of scale model warships equipped for R/C combat. Maintains and publishes guidelines for the uniform construction and operation of model warships which serve as Rules for its members and anyone wishing to construct a model warship in accordance with IRCWCC Rules. Sanctions events in which the participants agree to conduct R/C model warship combat in accordance with IRCWCC Rules. Organizes and sponsors at least one week-long “international” Annual Championship event open to all members. Encourages the formation of local groups interested in pursuing the construction and operation of scale model warships equipped for R/C combat in accordance with IRCWCC Rules. 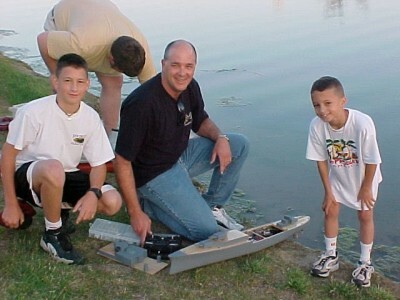 Many model warship events are conducted at the local level. Although it is possible to join only the IRCWCC, most members also join with others in local groups so they can battle more frequently. Local groups can also provide opportunities for “rookies” to learn from veterans the variety of skills needed to successfully build and battle a model warship. Some local groups host building parties where novices can get hands-on training and one-on-one help with specific construction problems. Local groups also provide an informal opportunity to meet with others interested in the hobby. 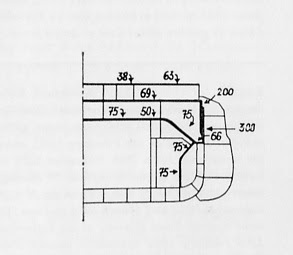 Why is the Hood 6 units? Probably the First Attempt to give Hood 6 units was in 1993 and failed. Hullbusters December 1993. Second attempt to get Hood to 6 units was in 1996 and failed. Hullbusters October 1996. Sometime in the early 2000s the Hood actually got bumped to 6 units in the ircwcc.